Gig all the time with my Mk III. And with the old EV 12 in it, even though I am in London, you can hear me in Brighton. What kind of footswitch is that? I see "boost" sign on it. Ho do you get your signal boosted with footswitch? I rehearse with my IIC and previously my 90 Mark I ri twice a week and play shows with em. The Boogie MKI, MKIIA and MKIIB amps offers a booster facility built inside the amp, accessible via a jack under chassis and (on the MKIIA and B at least) a "pull boost" switch on the Master1 pot. With some modification, this boost function can be footswitchable (open contact = boost ON) : that's what I have done here in my DIY FSW. Played my MKIIA last weekend, small club. Just a great amp. 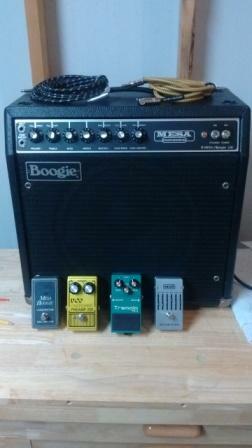 How often do you guys generally need to service your vintage boogies? I've never owned a vintage one, but think I'm going to take the plunge. My vintage 1965 Fender Deluxe needs a visit to the tech every 2 years or so. Usually it starts making frying egg noises and another part needs to be replaced. I'm gearing up to start gigging early November with a new band, and I'll be using the new-ish Coli MkIIB if everything goes according to plan. Failing that, it'll be back to the IIC+. The Mk combos I've been running for the last twelve months have all been completely reliable, and have been carted around a lot - though they haven't been thrown around to be fair, and are flight cased too. Who throws a IIC+ around anyway? The only problems I have had during this period have been with rack effects units (Yamaha SPX1000 and Lexicon MPX-1). Show four and five with my Mark IIB this weekend. It's been tough to get a good live sound. I'm going to use a MXR six band to try and see if I can get a little better cutting tone with the lead channel especially. This thing plus my SG is very muddy compared to a couple of Peavey's I have with EL84s, but the clean sound isn't as good on those - too bright. I'll definitely let you guys know if anything blows up, but everything looks good so far. Seems to have been built right. Here's what I'm working with! kdorsey wrote: The hot summer gigs were taking a toll on my MkIII and decided to park it for the regular gigs. For special events, it's still the beast of choice. Was it acting up in any way, or overheating? Gig this Sunday in a venue big enough for the MKIIA, yes! i tripped on the power cord and lucky the beast didn't land on me! I took my Mark 2C++ out last night for a drive. Mesa Thiele Celestion C90 cabinet.